Hotels & Resorts has opened its first property in Cape Town, the 137-room Hilton Cape Town City Centre in the heart of the city’s central business district. The hotel is Hilton’s third in South Africa. “Growing our footprint in South Africa is of strategic importance to us, and we are delighted to add Hilton Cape Town City Centre to our Africa portfolio,” Hilton Hotels & Resorts global head Dave Horton said in a statement this month. Located in the heart of the central business district on the corner of Wale and Buitengracht Street, the 137-room Hilton Cape Town City Centre converted to the Hilton Hotels & Resorts brand following a four-month transformation process. This included training the team in Hilton brand service standards, technology platforms and operations. Further changes to enhance food and beverage outlets and the lobby are underway and will be available for guests to enjoy soon. Nestled on the border of the Bo-Kaap and at the foot of Table Mountain, the hotel has 102 guest rooms, 20 executive rooms, seven one-bedroom suites and eight two-bedroom suites with spectacular views of the city. The hotel also offers two restaurants, a boutique chocolatier, business centre, executive boardroom and eight meeting rooms. All meeting rooms are equipped with plasma televisions, audio-visual equipment, complimentary Wi-Fi and high speed broadband. In addition, guests can enjoy a pool deck with swimming pool and bar, fitness centre, sauna and steam room and make use of the valet parking, and babysitting services. Hilton Hotels & Resorts is the flagship brand of leading global hospitality company Hilton Worldwide. 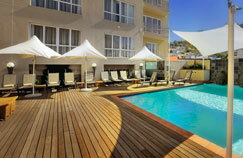 Hilton Worldwide’s other hotels in South Africa are the Hilton Sandton in Johannesburg and the Hilton Durban.